Caught this movie this weekend (after seeing the live-action Beauty and the Beast, which is probably my favourite live-action Disney adaptation so far, though this may have something to do with it starring Dan Stevens, aka Matthew Crawley from Downton Abbey, aka an actor I have loved since he was in obscure BBC drama The Line of Beauty). Kong: Skull Island was quite a bit better than I was expecting, though my expectations were quite low and I'm not really that into monster movies anyway, so that may not be saying much! One of the things I found very odd before going to see the film was the fact that it's a mash-up of a Vietnam war movie and the story of King Kong, which seemed a bit strange. Over the course of the film, that aspect of it did start to win me over, as it did seem to be doing some interesting things with that setting. 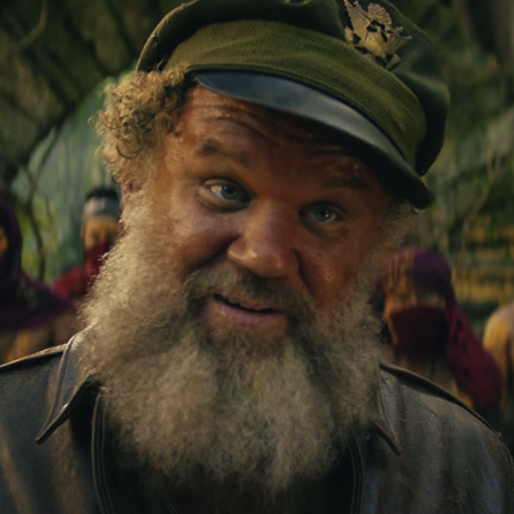 The story had some interesting things to say about war - for example, one character points out that sometimes an enemy doesn't become an enemy until you make them an enemy, which is an important point that runs through the film, and is illustrated in reverse - an enemy can become a friend - in John C. Reilly's Hank Marlow's mourning for the man we first saw trying to kill him because they were fighting on opposite sides in a war. The complexities of the issue are illustrated nicely through the group's changing attitudes towards Kong. Kong killed a number of the group when they arrive - that is an unassailable fact. However, the problem with Samuel L Jackson's character is, that fact is all he sees. He has no interest in either the reasons Kong behaved that way, which might seem valid from Kong's point of view, or in the ramifications of his desire for revenge on Kong, which might seem temporarily satisfying but will ultimately lead to more death and destruction for everyone. These are important issues and rather nicely brought out. Of course the main reason for the Vietnam war setting is that this is basically a re-telling of the Heart of Darkness story that formed the basis of Apocalypse Now. The number of images and sequences in this film that come straight from Apocalypse Now are countless, from helicopters to sunsets to images of silent, staring indigenous people to journeys up a jungle river. Tom Hiddleston's character is even named after the author of Heart of Darkness, Joseph Conrad. At the centre of the story is Jackson's Colonel, echoing Apocalypse Now's Colonel Kurtz, a man who does not want to return home, who cannot see beyond his desire for revenge, who has been twisted into madness by war. There is another story that is arguably the through-line of the film, however, and that is John C. Reilly's character Hank Marlow's story. It is with Marlow that we begin and end the film (discounting the post-credits sequences that refers to the wider cinematic Monsterverse) and his story is an even older one - the Odyssey. Like Odysseus, Marlow has been prevented from returning home for a long time, has a grown-up son he has never met, and worries about whether his wife is still waiting for him (though he has been gone 9 years longer than even Odysseus). It's no wonder, then, that the boat that brings salvation closer to him is named Athena, after the goddess who protects Odysseus and helps him. It's a tiny little Classical reference, easy not to notice, but it might just be a key to the true heart of the film - not the journey of Jackson's grim Colonel or those trying to stop him, but ultimately, really the story of Marlow and his long, epic struggle to get home.